I talk a lot about mornings here on the blog (and in general), but today I’m going to flip the script...let’s talk about our evenings and how we wind down. 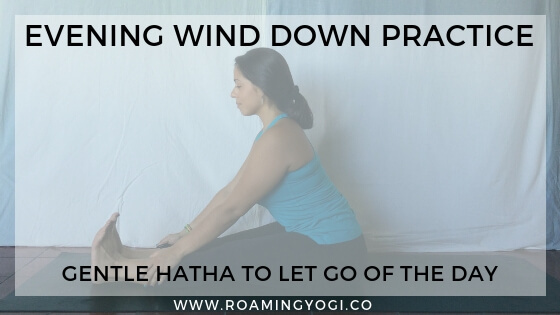 Down below you’ll find an evening yoga practice that’s gentle hatha, as well as an evening wind down meditation. How many times have you taken your day to bed with you? Or how many times has your day followed you to bed, uninvited? Conversations and scenarios play in my head. I could have said this… I should have done that… All the coulda woulda shouldas do their loop as I make dinner, and as I take a shower...as I turn down the bed. This is why many of us turn to television or social media in the evenings. To quiet down the incessant replay of the day. To decompress and get some space. But what if instead of pushing the day away, we took the time to acknowledge the day we had? What if we sat with it for a little while, and then consciously released it? How much easier would we fall asleep? How much more restful would that sleep be? That’s my invitation to you in this gentle hatha class and the accompanying guided meditation. Take the time to accept the day you had; without judgement or attachment. The truth is that whatever has happened has happened. Acknowledge it; accept it; release it. Join me on the mat and meditation cushion for these evening wind down practices, and relax into your evening and night.